My post Classical music's biggest problem is that no one cares has attracted an astonishing amount of attention. Among those who responded is Douglas Eck who works at Google researching in the fields of music search and recommendation, and generating music using machine intelligence. He posted the following comment about the post on the Facebook page of a member of the Computational Music Analysis forum. Aside from audio signal processing and machine learning, I worked on music performance modeling. What exactly does a good music performer add to what is already in the score? I treated this as a machine learning question: Hypothetically, if we showed a piano-playing robot a huge collection of Chopin performances--- from the best in the world all the way down to that of a struggling teenage pianist---could it learn to play well by analyzing all of these examples? If so, what’s the right way to perform that analysis? In the end I learned a lot about the complexity and beauty of human music performance, and how performance relates to and extends composition. As Tim Wu tells us in his book about the hidden commercial agendas that lurk online The Attention Merchants: "Ultimately, it is not our nation and culture but the very nature of our lives that are at stake". Douglas Eck says that we must understand the side effects of filter bubbles. Yes indeed, and it is not just the Internet corporations that are guilty of using collaborative filtering to create comfort zones. Communities of common interest also create their own artificial comfort zones, and none more so than the classical music industry. The observation from someone deeply involved in the future of future music technology that "I've nothing to add about classical music except that I highly suspect that it's popularity was waning before the arrival of recommender systems" deserves serious consideration by anyone claiming to care about the future of classical music. As do the following statistics. As I write, page views for my post challenging classical music's comfort zones are now approaching 100,000. To put that 100k into perspective, the classical music industry's comfort zone of choice the Gramophone currently has 6890 digital subscriptions and a print copy circulation of 16,272. * For those who like me are not up on the hip-hop scene the header graphic is The Low End Theory, the second album by the legendary group A Tribe Called Quest. Any copyrighted material is included as "fair use" for critical analysis only, and will be removed at the request of copyright owner(s). Also on Facebook and Twitter. Though a classical music fan, I am the father of a hip-hop loving daughter. 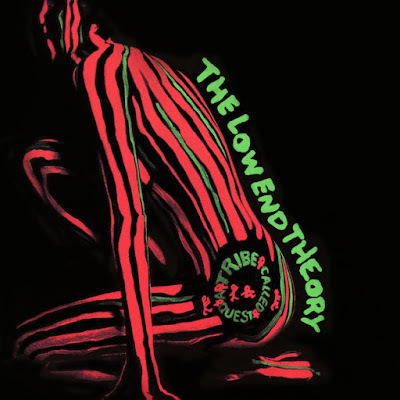 The featured album, called The Low End Theory, is the second album by the legendary group A Tribe Called Quest. It is worth a listen. David, thanks for that invaluable example of collaborative filtering. My error is now corrected.